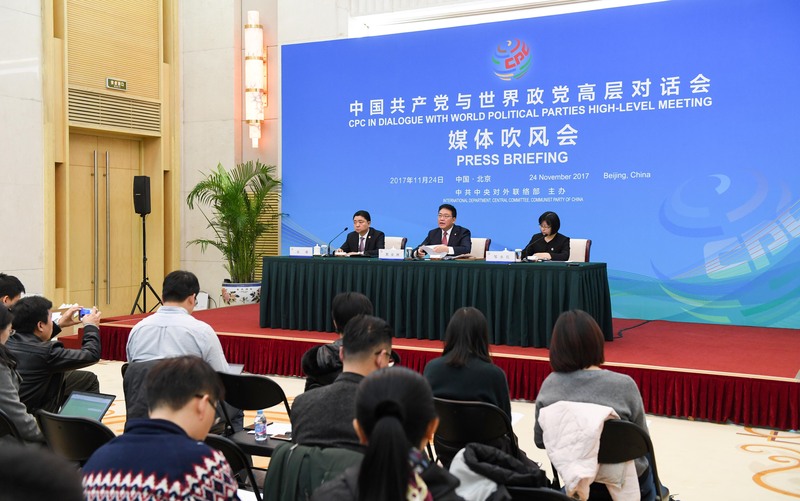 On November 24th, the International Department of the CPC Central Committee (IDCPC) held the press briefing on CPC in Dialogue with World Political Parties High-Level Meeting. Guo Yezhou, IDCPC Vice-minister introduced related situation of the CPC in Dialogue with World Political Parties High-Level Meeting, and answered questions from journalists. Over 50 journalists from more than 30 media including the People's Daily, Xinhua News Agency, China Central Television and others attended the press briefing. Guo said that the CPC in Dialogue with World Political Parties High-Level Meeting will be held in Beijing from November 30th to December 3rd. Xi Jinping, General Secretary of the CPC Central Committee and President will attend and address the opening ceremony of the meeting. During the meeting, other leaders and comrades of the CPC Central Committee will also attend the opening ceremony, the plenary session, the closing ceremony and other major activities. The theme of the meeting is “Working Together Towards A Community with A Shared Future for Humanity and A Better World: Responsibilities of Political Parties. Up to now, over 200 political parties and leaders of political organizations from more than 120 countries have signed up for the meeting. Guo noted that the 19th CPC National Congress is a meeting of great importance taking place during the decisive stage in building a moderately prosperous society in all respects and at a critical moment as socialism with Chinese characteristics has entered a new era. The Congress has established the Xi Jinping Thought on Socialism with Chinese Characteristics for a New Era as the guiding ideology that the CPC will adhere to for a long time, which is of profound significance and influence not only to China but the world at large. The international community pays high attentions to it, especially political parties from all countries respectively proposed to us that they hope to deeply and systematically learn about the spirit of the Congress through party-to-party exchange channel, especially know about the rich connotation of Xi Jinping Thought on Socialism with Chinese Characteristics for a New Era, and understand the CPC’s proposition on building a community with a shared future for mankind and a better world together. First, we hope to conduct joint consultation and discussion, as well as equal communication with political parties from all countries, in a bid to pool more strength and intelligence to deal with the development problems and common challenges facing human society and work together to build a community with a shared future for mankind. Second, we hope to learn from experience on party governance and state administration with political parties from all countries, so as to jointly improve the capacity in governance or participation in the deliberation and administration of state affairs. The CPC is open and inclusive, and it not only introduces its experience and methods to the world, but learns from the world. Third, we hope to provide opportunities for all kinds of political parties of various countries to conduct in-depth exchanges, so as to promote all kinds of political parties of various countries to reach more consensus on such major strategic issues concerning the future and destiny of mankind. Guo expressed that CPC in Dialogue with World Political Parties High-level Meeting is the first multilateral diplomatic activity held by China at home after the 19th CPC National Congress. It is the first time for the CPC to hold a high-level meeting with various kinds of parties in the world. According to the information we know, it is also the first meeting among leaders of world political parties with the most attendees, which has initiative meanings in the CPC’s history as well as ground-breaking significance in the history of world political parties. As for the main arrangements of the meeting, Guo introduced that besides the opening ceremony, the closing ceremony and the plenary session, it also includes a symposium on the spirit of the 19th CPC National Congress themed “The CPC in the New Era and the World” and four parallel sessions respectively themed “Enhancing Party Building: Challenges and Future of Political Parties”, “Building Wonderful Countries: Practices and Experiences of Political Parties”, “Jointly Constructing the Belt and Road: Participations and Contributions of Political Parties”, and “Leading the Building of a Community with a Shared Future for Mankind: Roles and Responsibilities of Political Parties”. Some of the leaders of foreign political parties will respectively go to the Party School of the CPC Central Committee for visits and discussion, and visit the large-scale exhibition on “Five Years of Sheer Endeavour”. Before or after the high-level meeting, such supporting events as the third China-Africa Political Parties Theoretical Seminar, the second China-Central Asia Political Parties Forum and the tenth China-US High-level Political Party Leaders Dialogue will also be held.